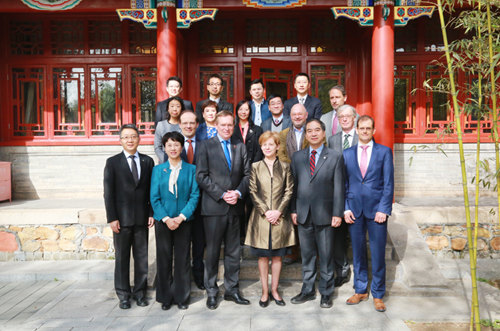 On the morning of April 10, 2018, the delegation of EUR, and officials of the royal Dutch embassy in China visited PKU. Leaders of schools and departments, including Gong Qihuang, vice president of PKU, warmly received visitors. Guo Li, vice dean of the law school, Song Ying, a law professor and Li Yuanyuan, assistant dean and director of External Affairs Office were involved in the reception. At 8:30 a.m., the reception officially started in the central nave of Linhuxuan. Vice President Gong Qihuang first represented PKU with sincere greetings and welcome to the visiting guests. 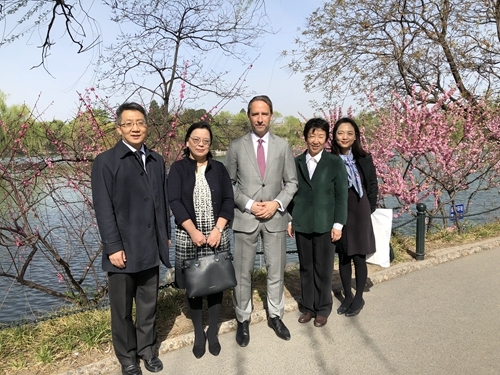 Peking University, he said, as the oldest and most prestigious university in China, had established good cooperative relations with many universities in Europe. EUR is also an important member of the partners of PKU. Kristel Baele, President of EUR, thanked Vice President Gong for his warm reception. She said that EUR as one of the world's top universities, ranked among the best in the world, and also cherished the opportunity to cooperate with PKU. 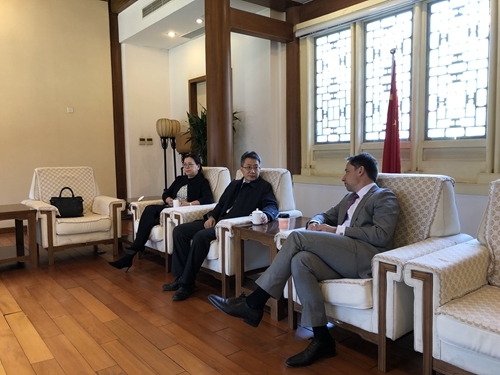 She hoped to take this visit as an opportunity to continue her in-depth and friendly partnership with PKU and jointly promote the research and teaching process in various fields between China and the Netherlands. Subsequently, representatives of both sides renewed the framework agreement between the two schools and the cooperation agreement between the two law schools, and conducted dialogue and communication at the department level. Guo Li, vice dean of PKULS invited Fabian Amtenbrink, vice dean of ESL and Li Yuwen, director of China law center visited PKULS. The two sides held cordial talks in Guoshuang Courtyard. Vice Dean Guo introduced the basic situation of PKULS, and showed the achievements in international construction. He said, a good partnership with ESL is regarded as a great contribution to the law school's teaching, research, and international development. Fabian Amtenbrink also noted that ESL is one of the largest law schools in the Netherlands and has a strong and cooperative foundation with Chinese universities and related research institutes. ESL has been attaching great importance to the Chinese law and providing assistance to the legal exchanges and intergovernmental cooperation between China and the Netherlands, which plays an important role in promoting the development of China-Netherlands relations. He was full of confidence and expectation to achieve in-depth and fruitful cooperation in the future with PKULS in terms of student exchanges, teacher visits and joint research. Attached: a brief introduction to EUR and ESL. Erasmus University Rotterdam (Dutch: Erasmus Universiteit Rotterdam) is located in Rotterdam, the second largest city in the kingdom of the Netherlands, Europe's largest port city. It’s one of the top 100 universities in the world. It’s the world's leading institution of higher learning, a prestigious public university, and it has the most prestigious school of economics and management in Europe and the world. EUR has been one of the best universities in the world. In 2007, EUR was named the top ten European universities. In 2018, EUR was ranked 72nd in the world by The Times higher education world university, including the 24th in the world of business and economics, the 40th in the world of clinical medicine, and the 69th in the world of the social sciences. ESL is one of the largest law schools in the Netherlands and is particularly famous for its commercial law, international law, law economics, and European law. ESL has a wide range of exchanges with Chinese universities and institutions. The collage has a special Chinese law research center, which is responsible for promoting the study of Chinese law in the Netherlands. 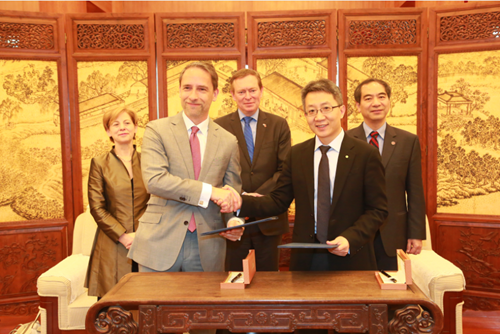 It also provides assistance to the legal exchanges and intergovernmental cooperation between China and the Netherlands. ESL was ranked 67th in the world university of the world rankings by The Times higher education in 2018.